There are three spin-offs from last year's exhibition, Australia: Defending the Oceans at the Heart of Aboriginal & Torres Strait Islander Art, held at the Oceanographic Museum of Monaco, currently viewable around the world. And the most exciting is at the UN in New York. The opportunity to exhibit works by Pormpuraaw Art & Culture Centre artists along with renowned solo artist, Brian Robinson, came about at the invitation of the President of the General Assembly himself after he visited the exhibition in Monaco. Brian Robinson, of course, is well-known and recently featured on the Aboriginal Art Directory when he won the Hazelhurst Works on Paper Award. But Pormpuraaw – that's both an odd word and not a well-known art-making community. In fact, there's been an art centre operating at Pormpuraaw on the western coast of Cape York for its Thaayorre and Kugu people for the past 12 years. Large-scale pieces built up from “ghost net” materials have been made there since 2009, and exhibited mainly at the Cairns Indigenous Art Fair. But the efforts of commercial gallerists Stéphane Jacob from Paris and Suzanne O'Connell from Brisbane brought them international prominence in Monaco last year. Now they're in New York. 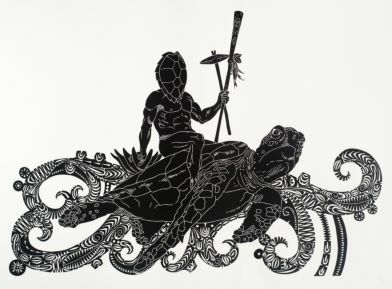 And ecologically-sensitive visitors to the UN this month may come face to face with a Crocodile by Elliot Koonutta that conjures up not just the power of a living crocodile but a wealth of mythology. In past times, according to the artist’s narrative, many of the region’s clan warriors were adepts of sorcery and had their own pet crocodiles. They made these unusual creatures for themselves, in secret, in a remote creekside place, shaping their images from the golden bark of the Yuk Nguchaman tree. The sorcerer would sing to his new 'child', then turn and leave that spot, seeking it out again several years later, to be greeted by a young crocodile the same colour as the bark of the tree. This is the beginning of a long relationship; the crocodile could kill at the request of its master, it would ferry him over swollen rivers, and the sorcerer gained the power to control the weather and tides. “These crocodiles are half human”, Koonutta told Nicolas Rothwell in The Australian. “They have a mind and senses like a person. 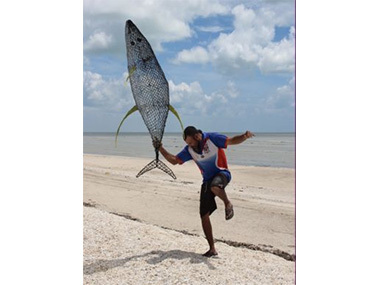 They hunt fish, turtle, dugong and take it back to their owners. The owner will never look the crocodile in the eyes. The crocodile is afraid of his owner and is aware that the man might kill him”. All this, implicit in a plastic net sculpture, made in memory of a tradition that existed several generations ago. It's complicated. But fortunately, a pair of guidebooks, written with the help of Pormpuraaw’s most senior artists, provide a more detailed overview: Pormpuraaw Arts and Culture surveys the region’s chief religious stories, and is narrated by senior cultural figures such as Jeanie Holroyd and the delightfully named Sid Bruce Short Joe. The second, newly released, is a detailed ethnobotany, Cultural Uses for Plants — a subject that may seem marginal to art-making, but in fact lies at the heart of local Indigenous artistic tradition. Could this background have assisted the Monaco show become such an international hit? For, subsequently, thirteen other institutions, globally, have invited the exhibition, including newly commissioned works, to be exhibited from now until 2019. The UN HQ show, now just called 'Australia: Defending the Ocean', focusses on the battle to curb ocean pollution in order to conserve and sustain traditional food sources, spiritual totems and marine ecosystems from the terrifying growth of international ocean pollution and illegal fishing. As a result, 18 newly commissioned ghost-net sculptures from Pormpuraaw, as well as Brian Robinson's aluminium stingray sculpture covered in his Wuthathi tribal markings, took pride of place at the entrance to the UN building during The Ocean Conference that ran from 5th-9th June, and on World Oceans Day. The display will remain at the UN Headquarters until the end of June, when the artworks will travel to the University of Virginia, where they will be exhibited at the Kluge-Ruhe Aboriginal Art Collection from the 15th July to 7th January 2018. Meanwhile in Europe, both Paris and Geneva feature spin-off exhibitions from Monaco. In Paris, the Aquarium de Paris presents a major exhibition on coral reefs. Its aim is to publicise the diversity and beauty of the underwater world, as well as initiatives intended to preserve this unique and important heritage for humanity. It's part of the 'Coral: Heart of Life' exhibition which showcases endangered coral and promotes the need for greater protection of reefs. In this context, art and science find themselves meeting at the crossroads in an ambitious artistic journey mixing installations, sculptures, street art and photographs. In Geneva, the Museum Ethnoqraphique de Geneve’s shows 'The Boomerang Effect: The Aboriginal Arts of Australia' in a space like a contemporary art gallery. Here the MEG reveals the wealth of Indigenous Australia's cultural heritage. “Visiting this exhibition, we understand how the attempts to suppress Aboriginal culture since the colonisation in the 18th century have ended up having the opposite of their desired result”, claims a press release. “In a real boomerang effect, the destruction of their culture has led the Aborigines to strengthen their identity and to display unprecedented creativity”. Alongside utilitarian objects and weapons (boomerangs, spears, shields) and artefacts used in exchanges between communities (engraved pearl shells, message sticks), the exhibition displays works illustrating Aboriginal mythological tales. 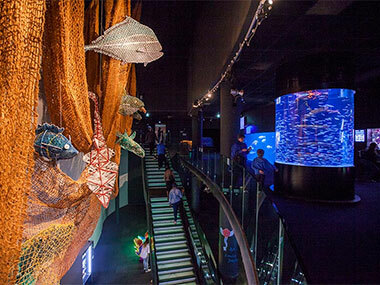 With the Ghost Nets project involving 28 new works, presented on a monumental scale in the MEG exhibition, Torres Strait Islanders and Pormpuraaw’s artists make marine animals out of bits of fishing nets lost at sea. Art thus becomes a tool for denouncing ecological issues. From the southern cities, artist Brook Andrew has been invited by the MEG to do a residency in the context of the exhibition, and focus his own gaze on the culture and history of Australia's first inhabitants. The Geneva exhibition runs until 7 January 2018.